Aardman Commercials have partnered with WARL and Clipper Tea, the UK’s only company to boast a completely Fairtrade and organic range of tea, coffee and drinking chocolate, to create a gorgeous new national TV ad campaign for their Everyday Teas. The 20-second stop frame commercial, which was launched on 27 April and runs for a month, has been brought to life by Aardman director Daniel Cohen, who has created a never-ending ‘conga’ of mugs joyously dancing past a box of Clipper Everyday Tea while being filled with tea bags and hot water from a kettle. “The simple concept of mugs dancing ‘the conga’ worked tremendously and was great fun to direct!” says Cohen. 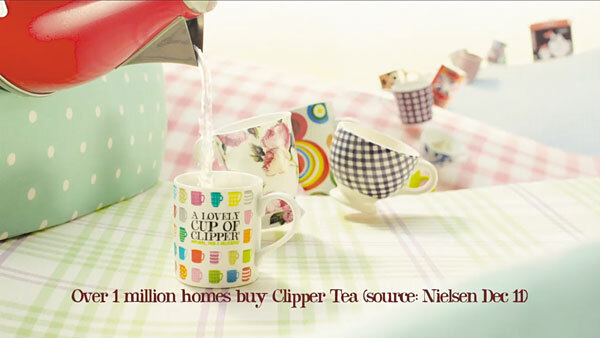 “The starting point for developing the ad was the fact that Clipper was the fastest growing everyday tea brand of 2011. We use this growing swell in popularity to reassure tea drinkers that Clipper tastes so good, cups all over the country are lining up – conga-style – to be filled with delicious Clipper tea.” Voiced by The IT Crowd’s Katherine Parkinson, she invites viewers to get their “10 free tastes” and join in with 1 million other people who have already discovered the Big, Bright taste of Clipper. The conga-line concept has been extended through the line into a wider campaign which includes on-pack promotions, national sampling activity and a social media campaign along with experiential activity planned at festivals throughout the summer. To alert existing Clipper-lovers to the forthcoming drive, WARL ran a competition among the existing Clipper database. The competition invited consumers to send a picture of their favourite mug and say why it should feature in the ‘Clipper Conga’. The winner – whose own mug appears in the ‘conga line’ – attended the commercial shoot at the end of March, and also enjoyed a special afternoon tea courtesy of Clipper. The TV campaign, bought and planned by The Media Shop, has been timed to coincide with Clipper’s repackaging of its Everyday Teas and the introduction of a new ‘Gold Blend’ addition to the range.